On Wednesday, January 9th, the Kildonan Lady Kodiaks basketball team travelled to Upton Lake Christian School. 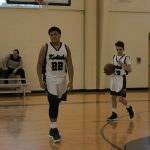 After an exciting four quarters of play, and a spirited comeback attempt, the Lady Kodiaks fell to ULCS, but they left with plenty of positive experiences. Ali Rea ’19 scored several important layups, increasing her team lead in total points. McKenzie Thompkins ’19 proved to be a steady leader at the point guard position. Caroline Laginstra ’19 scored her first points of the season. Mary Amendola ’22 added foul shooting points to the score. Kiana Morales ’22 and Maggie Teisler ’21 continued their high-pressure defense and additional help came in the form of speedy players Layla Hadwin and Emelia Collins. The Lady Kodiaks next play at Oakwood on Wednesday January 16th. With the improvement this team is showing each and every week, their first big win of the season could come at any time!